Netas is using Green Hills Software's INTEGRITY® RTOS and MULTI® integrated development environment to operate the Power Architecture-based control path software on its CAS (Ruggedized Converged Access Switch) specially designed for harsh environments. 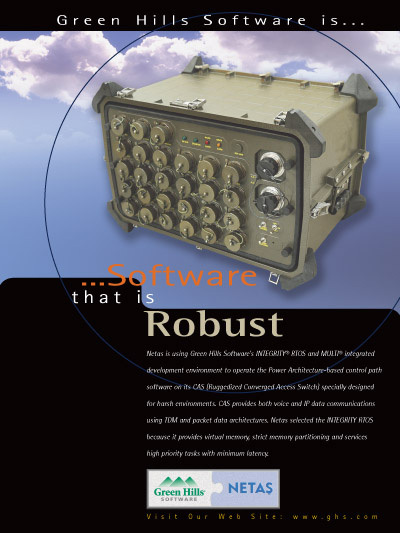 CAS provides both voice and IP data communications using TDM and packet data architectures. Netas selected the INTEGRITY RTOS because it provides virtual memory, strict memory partitioning and services high priority tasks with minimum latency.